Poughkeepsie, NY (November 13, 2018) – The Barrett Art Center has added a “Digital Docent” (SEO with Artificial Intelligence) to boost visitor engagement and streamline access to its community focused programs. The Barrett believes art and history play key roles in establishing local identity and fostering tourism. To address both, the Digital Docent recommends programs, classes, exhibitions and events that will stimulate engagement and foster discovery. It does this by making the digital equivalent of a “Best Sellers Table” available when a visitor clicks the Digital Docent icon on any page. Popular and important topics are displayed in a banner window, and when a visitor clicks one, recommendations are made that match the person’s interest. The Digital Docent is able to do this by reading and understanding the content and relevance of every page of the Barrett Art Center website, and then making recommendations based on content patterns that may not be recognized by humans. In addition to recommendations related to activities and art, the Digital Docent supports Barrett Art Center efforts to build stronger ties with local supporters, such as Dutchess Tourism www.DutchessTourism.com . The Barrett Art Center is located in downtown Poughkeepsie at the historic home of Thomas Barrett, which is listed on the National Register of Historic Places. It was built about 1835 in the Greek Revival-style popular at the time https://www.iloveny.com/listing/barrett-art-center/1332/ . Experience the Digital Docent at www.BarrettArtCenter.org . The technology behind the Digital Docent was developed by Trajectory Sports & Media Group, LLC, and Datanomers, Inc. It utilizes Machine Learning and Intelligent Machine systems that personalize content for Barrett Art Center website visitors. Since 1935 the mission of the Dutchess County Art Association has been to foster and perpetuate an appreciation of the visual arts in the Mid-Hudson Valley. Today, we operate under the name Barrett Art Center and interpret our mission broadly. We sustain our diverse contemporary art community through high-caliber art exhibitions that are free and open to the public and maintain a strong presence in the community, bringing together thousands of participants each year through collaborative art and history programs to reach diverse audiences in our inner-city neighborhood. The Barrett Art Center is located at the historic home of Thomas Barrett which was built about 1835 in the Greek Revival-style that was popular at the time. 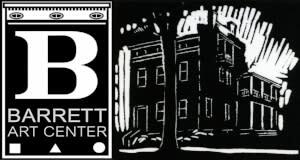 Learn more at www.BarrettArtCenter.org and https://www.iloveny.com/listing/barrett-art-center/1332/.